From ultra marathons to crossing the Sahara and beyond, this journey has taught me that we can truly exceed any limits we think we might have! Please see my bio below, and at the bottom of the page a list of completed races and expeditions! Ray Zahab is a Canadian Adventurer, ultra distance runner and Founder of non-profit impossible2Possible. A recent recipient of the Meritorious Service Cross of Canada, Ray is an Explorer in Residence of the Royal Canadian Geographic Society, and Fellow of the Royal Geographical Society. In 2015 Canadian Geographic recognized Ray as one of Canada’s Top Explorers. He has ran 14,000+km across the world’s deserts, and completed multiple unsupported expeditions in some of the coldest places on the planet. On November 1, 2006, former “pack a day smoker” turned ultra runner Ray Zahab and two friends, Charlie Engle and Kevin Lin, set out on an expedition to cross the Sahara Desert by foot. 111 days and 7,500 kms after leaving the coast of Senegal, Africa they completed their journey by stepping into the Red Sea. 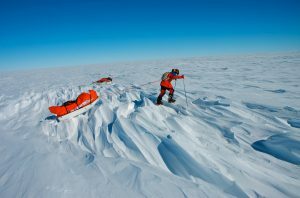 The expedition had the trio running an average of 70kms a day without a single day of rest, for 111 days. National Geographic tracked the expedition by web, as well as the documentary film ‘Running The Sahara’, produced by Matt Damon and directed by Academy Award winner James Moll, was created in an effort to raise awareness for the drinking water crisis in North Africa. After witnessing and learning about the water crisis in North Africa, Ray decided to leverage his future adventures to help raise awareness and funding for causes, like this one, that he supports and believes in. In fall 2007, Ray ran the three coastal trails of Canada back to back and each leg virtually non-stop, for a total distance of 400 kms. Logistics were as much of a challenge as the run, and Ray ran The Akshayuk Pass on Baffin Island, East Coast Trail Newfoundland and West Coast Trail in British Columbia, with just enough time to travel in between. In spring 2008 Ray partnered with the ONExONE Foundation for a unique ultra running project. Accompanied by a team of runners, Ray ran an average 80 kms per day in each of Canada’s 13 Provinces and Territories in 13 days. Once again logistics were a huge challenge. School visits were arranged along the way, students participated and communities became engaged in the run which supported the work of ONExONE, which supports various charities addressing children’s issues globally. In Saskatoon alone, several thousand students and 27 schools were involved in school rallies and a city wide relay with Ray and the team. In 2008, Ray founded impossible2Possible (i2P) (impossible2possible.com) an organization that aims to inspire and educate youth through adventure learning, inclusion and participation in expeditions. Youth Ambassadors are selected from around the world, and then participate, at no cost, in all aspects of the expedition, from logistics and running to creating educational content and team support. All of the i2P Youth Expeditions have included various challenge based initiatives through an Experiential Learning Program, in which thousands of students participate as active ‘team members’ during the expeditions, from classrooms all over the world. This program and its technology is also provided at no cost to the students or schools participating. Since its inception, i2P Youth Expeditions have included 14 gruelling expeditions; Baffin Island, Tunisia, the Amazon, Bolivia, India, Botswana, Utah, Peru, Chile, Italy, California, Greece, Death Valley and Canada. The programs and expeditions are 100% free of cost. In 2009, Ray and two fellow Canadians, Kevin Vallely and Richard Weber, broke the world speed record for an unsupported expedition by a team to the Geographic South Pole. In the process, Ray trekked this traditional route from Hercules Inlet to the South Pole, a distance of 1,100 kms, solely on foot and snowshoes, without the use of skis. Students from all over North America joined the team on a daily basis, a program provided through impossible2Possible, as the trio continued their southern trek. The students received daily communications and actively took part in every step of the trek. Essentially becoming “teammates” of the expedition, and teammates of the Guinness World Record achieved. In winter 2010, Ray and Kevin Vallely ran the length of frozen Lake Baikal in Siberia, 650 kms, over the course of 13 days, totally unsupported. Once again communication with satellite video conferencing to schools brought the expedition into classrooms, and classrooms onto the expedition. 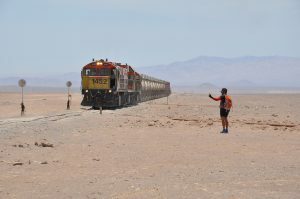 In February 2011 (Southern Hemisphere summer), Ray ran the length of the “driest desert on Earth”, the Atacama Desert in northern Chile, solo. Temperatures exceeded 50c as he ran and navigated the 1,200 kms in 20 days with minimal daily re-supply, and with emergency supplies on his back. Thousands of students joined this journey, again under his i2P organization, via live web and video conferencing. In August 2011 (Northern Hemisphere summer), Ray and Will Laughlin ran from the north park boundary to the south park boundary of Death Valley National Park, totally off-road. The 237 km run saw temps reaching over 120 degrees F.
This would be followed in 2015 with an abbreviated off- road crossing from north park boundary, exiting at the Badwater Basin after crossing the Devil’s Golf Course. Beginning June 23rd 2013 (summer), Ray ran over 2,000km, solo, across Mongolia and the Gobi Desert. Support team included both a film crew and photographer who recorded not only the expedition, and created an archive sharing the stories of the people and culture of Mongolia to schools around the world. This expedition was one of the “To The Edge” series of expeditions. In February 2014 (winter) Ray completed his 4th unsupported crossing of Baffin Island through the Akshayuk Pass (he would go on to complete 7 unsupported crossings in various seasons). In January 2015 (summer) Ray ran 1,000km across the Patagonian Desert, and then in summer 2015 Ray did a partial crossing of Death Valley National Park, his second project in the area. In February 2016, Ray Zahab (CAN), Jen Segger (CAN) and Stefano Gregoretti (Italy) set out on a unique and challenging expedition that spanned 100 degrees celsius on the thermometer. The team journeyed from -50°C (-58F) to +50°C (120F) over 1,500km, on mountain bikes and foot, crossing both Baffin Island in Canadian winter, and the Atacama Desert in Chilean summer. This would mark Ray’s second crossing the length of the Atacama Desert. In February 2017- Ray Zahab and Stefano Gregoretti would go on to complete the second and third stages of a three part expedition in the Canadian Arctic after a near disastrous start in which Ray broke through a frozen river in the Torngats Mountain Range. 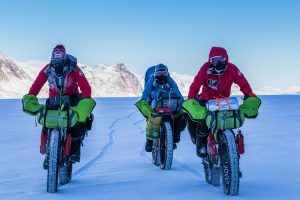 The duo rallied back to ski unsupported across Baffin Island, and then fatbike across the Northwest Territories along the Mackenzie Valley Winter Road (500km). Beginning mid January 2018 (summer), Ray once again teamed up with Stefano Gregoretti to run the length of Namibia, crossing the Namib Desert, approx. 1,850km. Summertime temperatures were intense, and terrain was a mix of cross country, open desert, canyons, gravel roads and track. September 2018, Ray completes his 7th crossing of Baffin Island, in 25.5 hours, coast to coast through the Akshayuk Pass. In winter (February 2019) Ray and teammate Stefano Gregoretti attempted an unsupported crossing of the Kamchatka Peninsula in far east Russia. After 19 days of brutal conditions, the team (no longer unsupported) was prevented from moving forward due to dangerous and fast flowing open rivers, and were unable to achieve their goal of reaching the east coast. Ray has also found the time to write two books about his life and adventures. Running for My Life published in 2007 and Ray’s second book, geared at youth readers, Running to Extremes, which recently became a National Best-Seller in Canada. He is currently writing his third book. In addition to being an adventurer, youth advocate and runner, Ray speaks around the world at events such as TED, IOC World Conference, Idea City, The Economist World in 2010 and 2011, World Affairs Council, and numerous Apple Distinguished Educator events internationally, as well as numerous corporate events. He has been interviewed and appeared on several talk and news programs including CNNi, CNN, The Hour, CBC, CTV, BBC, Jay Leno, OLN and Discovery, and has connected his expeditions live, using satellite to both mainstream and social media. He has also appeared in print media globally, and has been interviewed on numerous popular podcasts. Ray was the host of Project Guatemala which aired on OLN, and co hosted-guided a few episodes of Finding Sarah on OWN. Outside of his own organization Ray has volunteered as a board member, Ryan’s Well Foundation, volunteered as Athletic Ambassador of the ONExONE.org, and SpreadTheNet. He continues to volunteer with Run For Water, and various other initiatives. Ray received the ONExONE Difference Award in 2007, and the Torchbearers Award in 2010. He is a Fellow of the Royal Geographical Society and Royal Canadian Geographical Society. In spring 2012, Ray was invited by H.E. Tsogtbaatar Damdin (Minister of Environment, Mongolia) to join their Internal Advisory Committee. In 2015 Canadian Geographic recognized Ray as one of Canada’s Top Explorers. In December 2015 Ray was presented with the Meritorious Service Cross of Canada by the Governor General of Canada. In 2018 Ray was named Explorer in Residence by the Royal Canadian Geographical Society. He continues today with life as an adventurer and as a volunteer with impossible2Possible. ‘Running The Sahara’ would begin a lifelong journey of discovery. A journey of learning that some of the greatest barriers to achieving our goals are the ones we put upon ourselves. By breaking these down, Ray has learned that we are all capable of achieving truly extraordinary things…a message he continues to share with his two young daughters! Please scroll to bottom of this page for chronological list of projects and expeditions! The challenge is believing that overcoming obstacles is 90% mental and the other 10% is all in our heads. Leading to a discovery that we are ALL capable of achieving the extraordinary! The mission of impossible2Possible(i2P) is to encourage everyone to reach beyond their perceived limits, and to use adventure based learning programs to educate, inspire and empower young people all over the world. What is impossible2Possible (i2P)? from GOi2P on Vimeo. impossible2Possible Youth Ambassadors from GOi2P on Vimeo. impossible2Possible Education from GOi2P on Vimeo. September 2018 – Completes 7th crossing Baffin Island, Canadian Arctic in 25.5 hrs. February 2018 – Summer crossing of Namibia, and Namib Desert on foot, approximately 1,850km . February 2017- Ray and Stefano successfully ski unsupported across Baffin Island and fatbike 500km across NT after near disaster. Ray broke through a frozen river in the Torngats, and after a few more days of snowshoeing, abandoned the first stage. February 2016 – Ray and team rode unsupported on fat bikes from Qikiqtarjuaq, across Baffin Island, then immediately after rode mountain bikes 1200km north to south, the length of the Atacama Desert, retracing Ray’s 2011 running route across the desert. July 2015 – Crossed Death Valley from North Boundary to Badwater Basin off-road. January 2015 – Ran 1000km across Patagonian Desert. November 2014 – i2P Youth Expedition California Lost Coast. In May 2014, i2P Youth Expedition Atacama youth project. In March 2014, Ray completes his 4th unsupported crossing of Baffin Island. In December 2013, i2P Youth Expedition Peru youth project. In summer 2013 Ray ran 2,000+km across Mongolia and the Gobi Desert. May 2013 i2P Youth Expedition Utah youth project. November 2012 i2P Expedition Botswana Youth project. September 2012 Ray and Ferg Hawke run non-stop across Baffin Island. December 2011 i2P Expedition India Youth project. August 2011 ran close to 240km from North park boundary to South park boundary of Death Valley, totally off road. May 2011 i2P Expedition Bolivia Youth project. January 2011 ran length of Atacama Desert, 1191km from Peruvian border to Copiapo, Chile in 20 days. October 2010 i2P Expedition Amazon Youth project. May 2010 i2P Running Tunisia Youth Expedition. February 2010 ran 650km in 13 days unsupported across Lake Baikal in Siberian winter. September 2009 i2P Expedition Baffin Youth project. January 2009 trekked 1200km unsupported as member of 3 man team to Geographic South Pole from Hercules Inlet, 33 days, 23 hrs., 55 min. May 2008 ran average 80km per day in each of Canada’s 13 Provinces and Territories, in 13 days. August 2007 ran 3 coastal trails of Canada (Akshayuk Pass, Baffin/East Coast Trail/West Coast Trail) back to back, in 8 days. November 2006 ran 7500km from Senegal to Red Sea, crossing the Sahara Desert in 111 days.